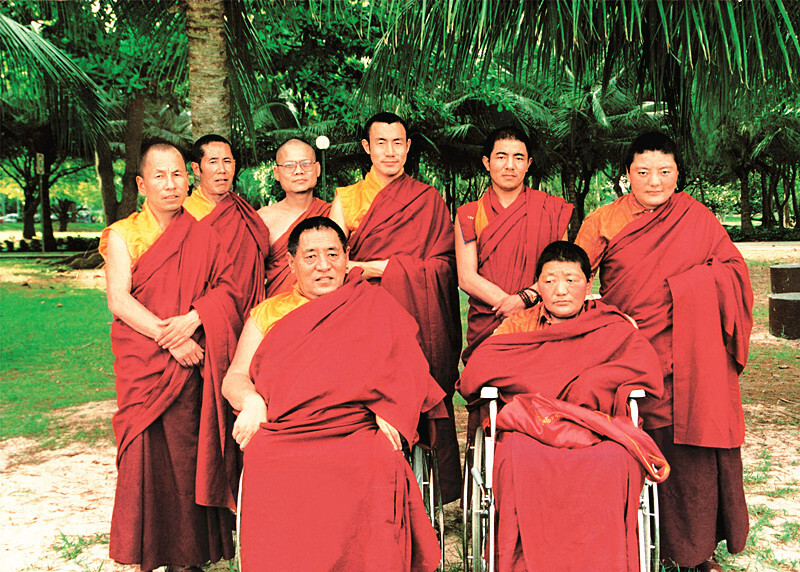 The dharma activities of His Holiness Jigme Phuntsok Rinpoche’s life can be divided into six main phases. Each phase is marked by an important pith instruction text. The Song of Victory was an extemporaneous vajra Doha sung by His Holiness in front of almost five thousand ordained sangha on an auspicious victory-celebrating day in the Tibetan calendar, the 21st September, 1996, when His Holiness and his disciples had dispelled all the external, internal and secret hindrances. These texts are not like ordinary articles drawn from a few years of academic research studies, but rather they are the essence of His Holiness’ wisdom gained through a lifetime of study, reflection, and practice. His attained realization, his biography and his considerable merit have proven him to be a great saint and an enlightened master in each of his lifetimes spanning from the time of Buddha Shakyamuni to that of Guru Padmasambhava. This Song of Victory is described by the metaphor ‘the Wonderful Sound of the Celestial Drum’ because this drum has a natural sound that means “all you celestial beings, do not fear”. As when celestial beings were battling the Asuras, with the help of the wonderful sound of the Celestial Drum, they were able to defeat the Asuras and win the battle. Hence the title draws this analogy between the Song of Victory and the Wonderful Sound of the Celestial Drum. This short text contains the essence of all the sutrayana and tantrayana teachings, as well as the very profound pith instructions of His Holiness’ lifetime of practice. The unsurpassed Great Perfection, proclaiming the luminous essence of tathagatagarbha, is difficult for ordinary people to fully understand, and is often criticized by those with poor wisdom. However, one can cut off the root causes of samsara simply by listening to its verses, and those with great capacities are able to attain liberation if they practice its essence diligently for six months. Therefore, we must have this Great Perfection deeply engraved in our hearts. The Great Perfection is the essence of all sutras and tantras, and its merits are beyond all description. People can attain liberation by merely hearing its words, touching its texts, attaching it to one’s body, or understanding its meaning. According to Aryadeva’s Four Hundred Stanzas on the Middle Way, people with doubts about emptiness are still able to break from the cyclical existence of the three realms. This is even more true for those who have learned the unsurpassed Vajrayana. Based on the authentic teachings and the personal perceptions of the enlightened buddhas and bodhisattvas, we have learned clearly that all deluded beings have previously been our parents and now are suffering. So carefully they have cared for and tended us, so closely we have connected with each other. Even though they do not recognize us now, anyone with a certain level of conscience would never leave them aside to pursue his or her own peace and happiness, but would rather guarantee their greatest peace and happiness. That is, to liberate them forever from the dreadful ocean of samsara and attain supreme enlightenment. Therefore, we must shoulder the responsibility of altruism in order to help them obtain temporal happiness with good food and nice clothes, and meanwhile to guide them to achieve the ultimate happiness through the realization of arhats, bodhisattvas and buddhas. We must get rid of poison-like selfishness as much as possible; otherwise retribution could be very serious. In order to achieve ultimate liberation from samsara, we must not have even the slightest thought of desire towards dazzling events and wealth in this ordinary world. Instead we should conscientiously observe the pure precepts, to which humans and gods make their transcendent offerings. For those who wish to break away from reincarnation and attain liberation, the attainments of fame, power, high social status and sensual enjoyment are totally meaningless, and do not stir up any desire within them. They view luxurious cars and mansions as if they were objects in a dream, illusions, or bubbles. They are not just paying lip service, but truly feel that the three realms are like a house on fire without any momentary bliss. They are the ones with a real renunciation mind. Dharma practice requires a virtuous personality, this is the essential teaching summarized by His Holiness through many years of his teaching. His Holiness required that anyone who studies at Larung Gar must follow three rules, which are 1) to cultivate a virtuous personality; 2) to uphold the pure precepts; 3) to listen, reflect, and meditate on the Dharma teaching. Not mention to achieve enlightenment. In summary, His Holiness Jigme Phuntsok Rinpoche addressed four major piths in this text, which are the non-dual wisdom in the context of Mahayana and Vajrayana teachings, Bodhichitta, renunciation, and virtuous personality. These four piths are the essence of all 84,000 Dharma teachings being summarized through his theoretical study and personal realization. Each of us must keep them firmly in mind.